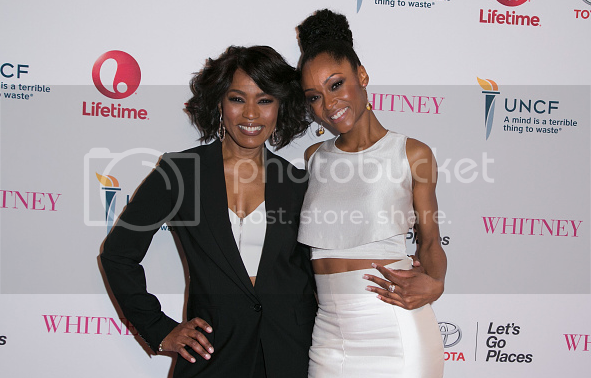 Angela Bassett on Her Lifetime Biopic: Whitney "Would be Pleased"
Home Angela Bassett Lifetime Whitney Angela Bassett on Her Lifetime Biopic: Whitney "Would be Pleased"
“Yeah, we’re that mythical creature, the female director,” says Angela Bassett of directing the Lifetime biopic, Whitney (premiering Saturday, 8 p.m. ET/PT), keenly aware of this most rare break in Hollywood – particularly for a woman of color. “I didn’t think about it, but I was proud to do it and grateful to have the opportunity. But yeah, it’s a big deal. It’s a big thing, you know. I kid saying the ‘mythical creature,’ but it’s true because there are still very few.” And even more devastating still, given the Academy’s snub this week of Selma’s Ava DuVernay for a much deserved Best Director nomination. Frustrating still, following the leaked emails at Sony revealing their top 10 go-to directors: all male, all white. Whitney, then, becomes a radical achievement – whether critics give it props or not – simply by its perspective: a black woman celebrating the story of one of her own, and one with whom the 56-year-old actress co-starred in 1995’s Waiting to Exhale. The film, which centers on what Bassett calls “the glorious years” of Whitney Houston’s rocketing music career and her courtship, and eventual marriage, to Bobby Brown, is a story Bassett believes required a certain gentleness that no man could bring to it.